For eight years, UNO has invited dozens of high school students from across the state to campus to get first-hand experience in the field of athletic training. Students have traveled to UNO from Lincoln, Kearney, Hastings, Grand Island and North Platte. In this photo, a UNO student performs a diagnostic test on a student volunteer, also from UNO. There’s a steady stream of athletic trainers working in high schools across Nebraska, and significant portion of that trend begins at UNO’s High School Athletic Training Day. For the past eight years, the athletic training program at UNO has hosted high school students from throughout the state to show them the basics of being an athletic trainer. It originally began with just students from Omaha-area high schools but since has grown into a regional event with athletic trainees traveling to Omaha from Lincoln, Kearney, Hastings, Grand Island and North Platte. The event provides an opportunity for students with athletic training to get experience outside the classroom. 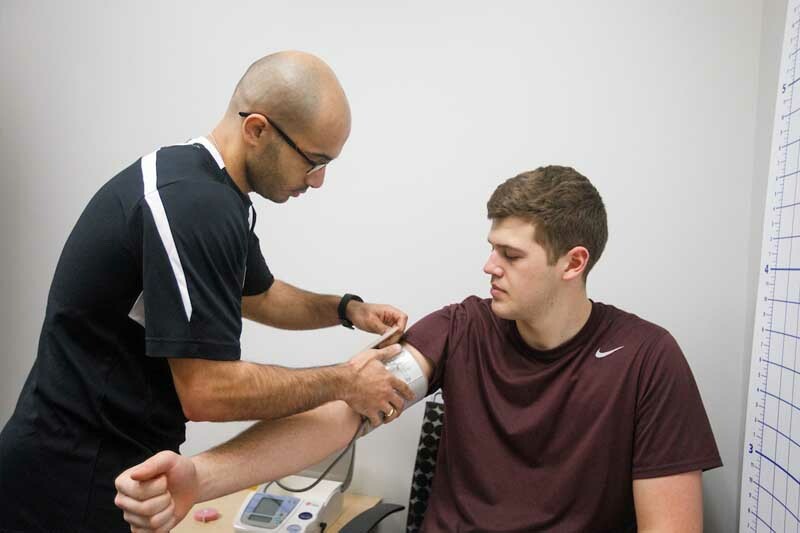 “We’re doing a lot of hands-on activities and providing an opportunity that the high school students probably wouldn’t have gotten at school,” says Sam Wilkins, an instructor in UNO’s School of Health and Kinesiology. While most students have some athletic training experience, it isn’t a requirement. UNO’s free, one-day camp, then, often becomes a catalyst for other training experiences. Students with even the smallest interest end up with lots to gain. The event consists of two sessions, including hands-on training in the morning. Opportunities include a spine- boarding session; learning how to tape ankles, knees, and elbows; basic first aid; and a session about concussions and head injuries. “We don’t want to get students here and put them in a classroom and have them listen to people talk all day long,” Wilkins says. UNO students also get valuable experience as they facilitate all sessions alongside faculty, staff and even some alumni. UNO’s athletic training program has alumni scattered at high schools across the state. Many of them nudge their students to attend UNO. The day as a recruiting event, though, isn’t the program’s goal.